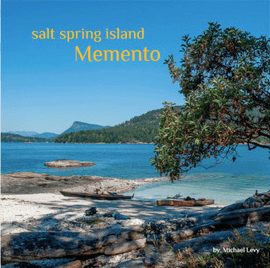 Salt Spring Reads is an online book club/review. For this column I try to find books that you might love to discover, books with a Salt Spring connection. 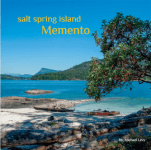 Reviewed books are available at the Salt Spring Library and in local bookstores. Feel free to share your comments to discuss this book online with others. If you are a local author, you can submit your book for review. This book is perhaps our island’s best kept secret. I had heard about the book from friends who had seen it but I found it hard to find a copy. Most people I show this book to, have not seen it before. But it is a book that should be on every coffee table on Salt Spring Island. Gorgeous photos showcase the island as the unique, special place in the world it is. I own photo books about Oregon, Alaska, Mongolia, Malaysia. This book is every bit as impressive and attractive.The photos focus on natural beauty and people. You will spot familiar faces as well as locations on the island you have never seen before. Waterfalls and trees, rocks in the ocean and people at the market. The eye of the photographer makes you see ordinary scenes in a new and different way. Some photos are scenic snapshots, others artistic masterpieces. If you did not get this book for Christmas or your birthday, rush out and by yourself a copy. And you can send it to friends far away who don’t believe that you live in paradise. This book is proof that you do. Margriet Ruurs is a Salt Spring Island author of over 35 books. Her book Stepping Stones won the Bolen Book Prize.